Artillery fire control vehicles 1V13, 1V14, 1V15 and 1V16 of various modifications distinguished by structure of the equipment are the part of complexes 1V12, 1V12—1, 1V12M, 1V12M-1. The vehicles provide investigation and fire control of platoons, batteries, battalions both day and night, at any season, under any weather conditions in intervals of ground temperatures from −40OC up to +45OC at relative air humidity 98 %, dust content in the air up to 2 g/m3, in mountains at any altitude up to 3000 m above the sea level. 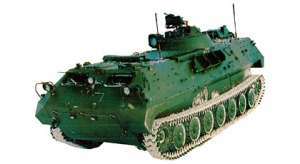 Is intended to control fire platoons and is located on the fire position of the battery, so as to facilitate fire control. • maintaining the communication with the staff chief, battery commander, battalion commander, and gun commander. The crew consists of the battery senior officer, squard leader (topogeodesic equipment operator), senior radio-telephone operator, computer operator, and driver. Is a mobile command observation post of the battery and is intended for reconnaissance and fire control of the battery in close cooperation with motorized infantry and tank units during combat operations. • maintaining the communication with the headquarters staff, with the commanders of subordinated, attached and secured subdivisions. The crew consists of the battery commander, squard leader (topogeodesic equipment operator), senior radio-telephone operator, radio-telephone operator, reconnaissance equipment and range finder operator, and driver. Is a mobile command observation post of the battalion commander and is intended for accomplishing reconnaissance missions and fire control of the battalion in close cooperation with motorized infantry and tank subdivisions during combat operations. The vehicle is intended for the same tasks, as the battery commander’s vehicle. The crew consists of the battery commander, squard leader (topogeodesic equipment operator), senior radio-telephone operator, reconnaissance equipment and range finder operator, operator, and driver. • maintaining the communication with the regiment headquarters, battalion commander, battery commanders and senior officers with the attached artillery reconnaissance means.